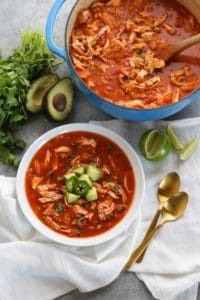 Grab a spoon and some avocados… This hearty Chicken Tortilla-less Soup will have you coming back for seconds! You know I can’t stop there. Give me something food-related to talk about and I can go on for hours (ask Stacie – she’s witnessed this more times than she can probably count). But, seeing as it’s Sunday and I need to get in the kitchen for a weekly meal prep sesh, I’m just gonna hit the highlights and say that I freaking love soup. 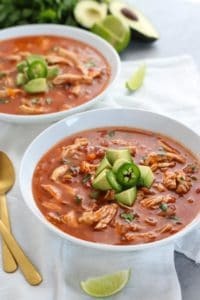 Soup is my go-to breakfast most days of the week and right now I’m totally crushing on this Chicken Tortilla-less Soup. But it’s also great for lunch and dinner. I just happen to like my soup before noon because it’s a great way to get in a bunch of veggies and healing bone broth with very little sugar (just what’s naturally occurring in the veggies). Because the last thing I want is mid-morning cravings and a sugar crash. Ain’t nobody got time for sugar crashing. Cast iron. I’m totally obsessed with cast iron (again). I learned to cook in cast iron from my dad and did so for many years until I was seduced by a set of fancy stainless steel pots and pans the hubby got me for an anniversary gift. I gave them a try for a couple years then admitted that I hated them. The heat seemed uneven, the lids weren’t tight fitting, everything seemed to stick and it was impossible to get a good sear on anything. So I pulled out the old cast iron and seasoned it back up and thus my love affair with cast iron was rekindled and those pans went up on Craigslist. So when our friends at Lodge Manufacturing, makers of all things cast iron here in the U.S., reached out and asked if I’d be interested in sharing a recipe using one of their enameled Dutch ovens I was stoked. As much as I love me some good ol’ fashioned cast iron, I really love enameled cast iron for it’s easy care and gorgeousness. This 4.6-qt. enameled Dutch oven with lid just begged for a saucy and slightly spicy soup and thus this Chicken Tortilla-less Soup came to be. Win a Lodge enameled cast iron Dutch oven to call your own! We’re giving away a 4.6-qt. enameled cast iron Dutch to one lucky winner. Just head over to our Instagram feed to enter – contest ends March 29th, 2017 at Midnight CDT. So print out this recipe and get over there and enter. Because soup and cast iron are life. Place a large Dutch oven over medium heat. Add ghee. When ghee is melted, nestle chicken breasts into the bottom of the Dutch oven in a single layer. Cook 5-7 minutes then flip and cook an additional 5-7 minutes. Push chicken breasts to the side (stacking them is okay), add onions, red peppers, jalapenos, taco seasoning, cumin and sea salt. Stir to combine and cook for 5 minutes or until onion and peppers start to soften. Add garlic and cook an additional 30-60 seconds or until fragrant. Add 3 cups broth and crushed tomatoes. Bring soup just to a boil then cover and reduce heat to simmer. Cook 20 minutes until vegetables are tender and chicken breasts are cooked through. Remove chicken to a cutting board and allow to cool before shredding with two forks. Add additional broth, if needed, to reach desired consistency. Return shredded chicken to pot and stir. Add cilantro and lime juice. 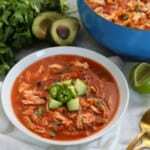 Serve with diced avocado and lime wedges. What’s your favorite soup to make? Are you a cast iron cooking newbie or an old pro? Share in the comments below and let’s get the convo started! This post was made possible by our friends at Lodge Manufacturing. Though we received product in return for this post, the opinions expressed here are – as always -100% our own. Thank you for supporting the great companies we work with thereby allowing us to continue creating great recipes and content for you. 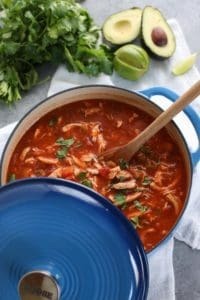 Chicken tortilla soup is so so good, but I’m starting Whole30 in 2 weeks, so this recipe is a life saver! Hooray for life-saving, Whole30-compliant, hearty soup recipes! 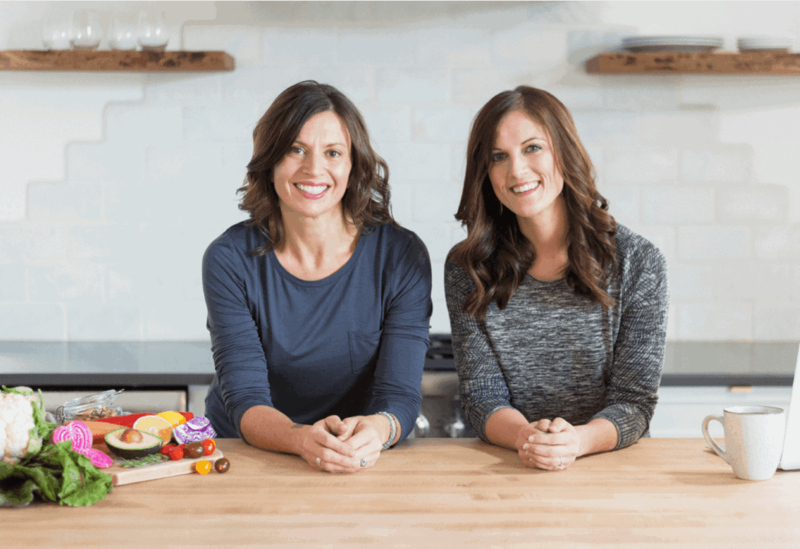 Have a great Whole30 – we’ve got lots of recipes to keep you sane and satisfied! I haven’t tested it in the Instant Pot (yet) but my guess is you could proceed with the recipe as written through Step 3 (using the ‘Saute’ function) then add the broth and chicken before locking the lid in place and selecting ‘Poultry’ setting for 15 minutes. That’s how I’d approach this recipe in the Instant Pot. I’ll officially update the recipe once I’ve tested it in the Instant Pot. Hope that helps! Awesome! You rock, thank you! Hi! 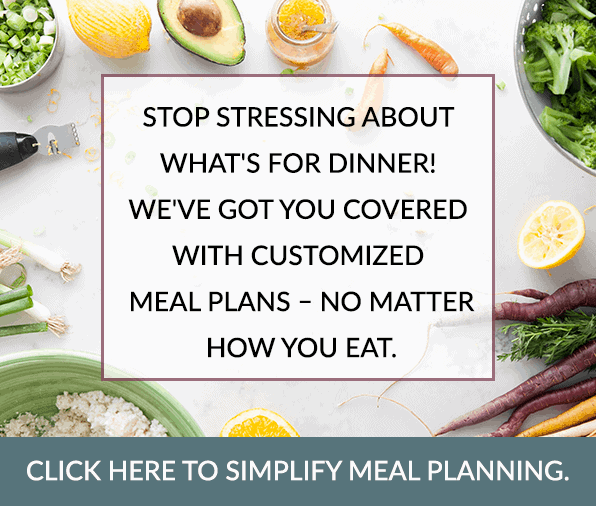 Wondering if you have tried your own suggestions in the instant pot yet. I was hoping to make this soon and would love to just use my instant pot to make it vs stove. Also, in the IP, would you use thawed chicken or frozen? Thanks so much! Excited to try it! I have not tried this in the IP yet. 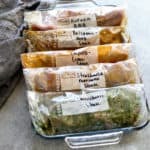 You could use either frozen or thawed chicken – the IP will just take longer to come up to temperature before the cook time starts to count down. I tried it in my instapot. I sautéed the chicken breast and jalapeños for about ten minutes to get that carmelized flavor. Then added all the ingredients and set it on low for 5 hours. Came out perfect!! Thanks for sharing, Cathryn. I’m so glad you enjoyed it! I finished my first Whole30 last month. Soup was my saving grace!!! I would make a huge pot on Sundays and would eat half of it throughout the week and freeze half. The freezer jars are wonderful for times I’m in a time crunch. I thaw them in a warm water bath and then heat and eat. I’m excited to try this recipe! Thank you. Congrats on finishing your first Whole30! Soup is always my saving grace on a fall/winter Whole30 (and pretty much all the time in between those, too). Great tip to thaw your containers in warm water – I do that too when I’ve used glass containers or jars (allowing them to sit a room temp for a bit before plunging them into warm water to avoid cracking the glass). I hope you enjoy the recipe! 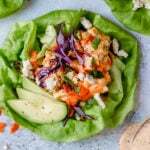 Adding the avocado is key (it’s pretty low-fat without it) and if you want some crunch adding sliced radishes or jicama will keep it Whole30-compliant. It looks tasty! What is ghee? It’s really good. Just enough spice but not overly ‘spicy’. 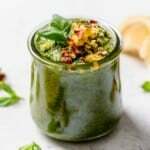 Ghee is clarified butter – the butter is heated slowly then the milk solids are skimmed from the butter fat leaving a very pure and rich-tasting fat (ghee) that has a high-smoke point (so it’s good for sauteeing and roasting) and it’s generally very well tolerated by those who don’t tolerate dairy. You can read more about ghee (and which one’s we love) in this post. Oops! Sorry about that. You add the garlic after the onions are softened. It only needs about 30-60 seconds of cooking. I’ve updated the directions accordingly. Hello! Do we have to use Ghee? I have had serious dairy issues and am avoiding butter products. Anything else I can use as a substitution? 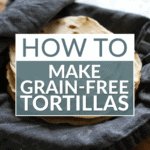 You don’t have to use ghee. Feel free to use coconut, avocado or olive oil. If I don’t have a dutch oven, what do you suggest? Any large pot with a lid will work. Awwww…thanks for the positive review Jill! SO good and SO easy! I had leftover chicken from the night before so I used that. Perfect fall/winter soup!! 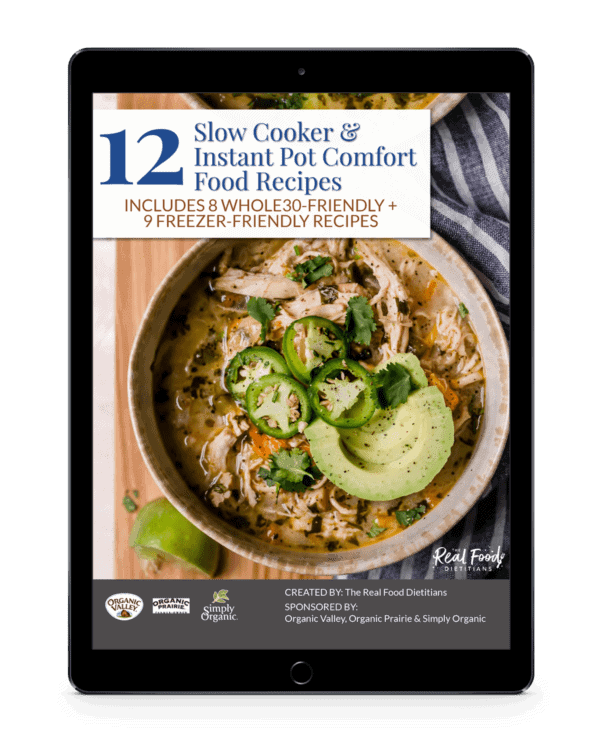 So glad you loved it – it’s a great way to use up leftover cooked chicken or rotisserie chicken. Do you have any idea how big the servings are? I see it’s 1/8th of the recipe but I’m curious about if those are bowl or cup size servings? 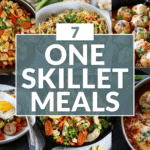 I want to make sure I have enough for everyone as a main dish. I don’t know the exact serving size though this recipe makes about 4 quarts of soup so that would work out to be about 2 cups per person. Hope that helps! Hi! I made this last week and it was sooo delicious! I used a can of fire roasted diced tomatoes, added a diced zucchini and squash. That sounds amazing! We love the addition of zucchini and squash. This soup was amazing! Soooo flavourful. Love that it was all made in one pot! Thanks for the feedback! Great to hear you enjoyed this soup! How do you feel about making this soup and freezing it? We already have our meals for this week planned but I have time to make this today. I’m on the whole 30. Thanks! Okay great. My soup is kind of runny, maybe I should have drained my tomatoes. Any recommendations to thicken it up? I don’t usually drain my tomatoes but they could differ from brand to brand (I use Muir Glen, if you’re wondering). To thicken it up you could either simmer it uncovered a bit longer or add a couple tablespoons of tomato paste if you have some on hand. This looks so yummy! Any suggestions for preparing this in a crockpot? Thanks in advance! Hi there! While we haven’t tried this recipe in the slow cooker, I’d imagine it will work. My recommendation would be to follow the recipe as written and slow cook it for 4-6 hours on low or until chicken is cooked through. Let us know if turns out! This soup was fantastic, huge hit with my whole family! Yay! We love to hear this. Glad you all enjoyed it. Is there’s pepper a bell pepper? I’m not sure what you’re asking. Can you clarify? I wondered the same. What kind of pepper is the red pepper in the recipe? Is it red bell pepper? Yes, it’s a red bell pepper. However, if you like things spicier, feel free to add other peppers as well. 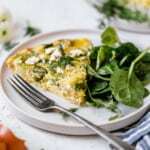 Im making this tomorrow and cant wait however as far as Portions go what exactly is an eighth of a recipe? I am trying to do portion control and calorie awareness. Thanks. Hi Michelle. It would be about 1 1/4-1/2 cups. Hope that helps! I made this in the instant pot with thawed chicken breast and it turned out great — I sautéed the veggies and spices using the built in sauté function on the IP. Then I added all other ingredients and gave it a stir. Cooked on manual for 9 minutes with a 9 min natural release followed by quick release. Probably could’ve cooked a little shorter to have more moist chicken. This is great! Thanks, Caroline, for sharing how you made this in the Instant Pot!